I have one very important thing to say about it, it is AWESOME! There is no wonder that it was among the best-selling guns in the last five years. According to Taurus it is their #1 selling gun. And for good reason. The PT111 G2 has 3 active safeties and 1 passive safety. Some will love the manual safety; others will hate it. I personally carry the PT111 G2 with the safety off. I know of some people who super glue their safety into the off position. If you prefer to carry a pistol with a manual safety, you’ll like the one on the PT111 G2. It flips back and forth with ease & a nice tactile click. In addition, it has a low profile which keeps the gun slim and trim for everyday carry. Regardless of Taurus’ rocky past with quality, they have clearly been producing quality guns for over a decade now. The PT111 has a great striker-fired trigger. It hits the wall a little further back than other striker fired pistols like the VP9 or PPQ. However, it should be said that it is still a very decent trigger. While it may not be quite as nice as the PPQ trigger, it is about half the cost. Many concealed carriers will gladly make that trade off! Once the trigger is pulled, the reset is not too far forward and the following trigger pull is ready to go pretty fast. While there is a touch of take-up and spongy feeling, it’s minimal. Overall, the PT111 trigger outperforms many other striker fired pistols on the market that cost more than twice as much. 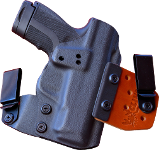 Taurus PT111 G2 holsters are easy to find as the gun is very popular. We have made available multiple Taurus PT111 G2 holsters. The Comfort Cling holster even enables you to pocket carry the Pt111 G2. Yep, that’s right; pocket carry the PT111 G2. I’ve done it more times than I can count. You can also look for the latest version of this pistol, the G2C. Clinger, of course, has the bet Taurus G2C holsters.